Davison House Fellows, HFIs and Halloween Fest volunteers gathered for a group photo that brims with the joy of putting together an event for the community. ￼￼Courtesy of Kevin Fernandez. Halloweekend is a magical time not only for Vassar students, but also for children in the community. 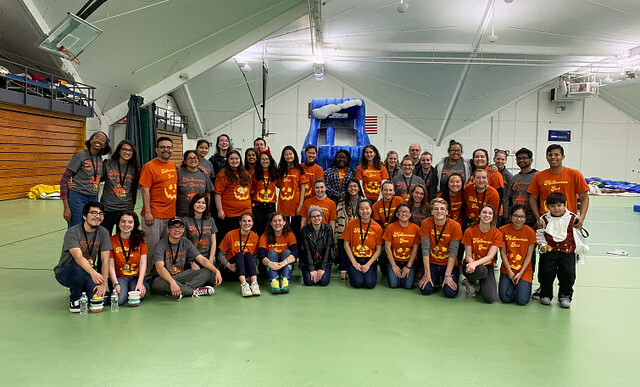 One of the events that connected the College to the larger Poughkeepsie area this season was Davison House’s Halloween Fest, which took place on Saturday, Oct. 27, at the Walker Field House. The Town of Poughkeepsie Parks and Recreation Department initiated the Halloween Fest 12 years ago, and former Davison House Fellow and Associate Professor of Education Colette Cann became involved a few years later. 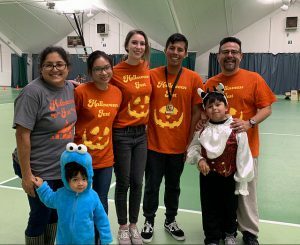 Cann, along with her House Fellow Intern team and the Good Neighbors Partnership (a committee that provides grants to Vassar students, staff and faculty who collaborate with the local community), made Halloween Fest a Davison House tradition. This year, Davison House’s new House Fellows, Maritza Del Razo and Assistant Professor of Education Jaime Del Razo, continued the ritual with support from local businesses and the Town of Poughkeepsie Parks and Recreation. Left to right: House Fellow Maritza Del Razo, with son Joaquin, Thuy Le ’21, Brenna Douthitt ’20, Kevin Fernandez ’20, House Fellow Jaime Del Razo and David Fernandez. Courtesy of Kevin Fernandez. Del Razo, Douthitt and Fernandez acknowledged the support of the Town of Poughkeepsie Parks and Recreation, the house team, the 40 student volunteers, the Good Neighbors Partnership, Twisted Soul, Poughkeepsie Farm Project and the Barefoot Monkeys. These collaborations allowed the event to be the grandest it has ever been, hosting over 15 different activities both traditional and new. Douthitt, Fernandez and the rest of the Davison House Fellow Intern team have major plans for the future. Spring Fest, another event thrown by Davison House, will again offer free activities to the community, this time with a springtime theme. The HFI team considers Halloween and Spring Fest important in bridging the gap between the town and the college.